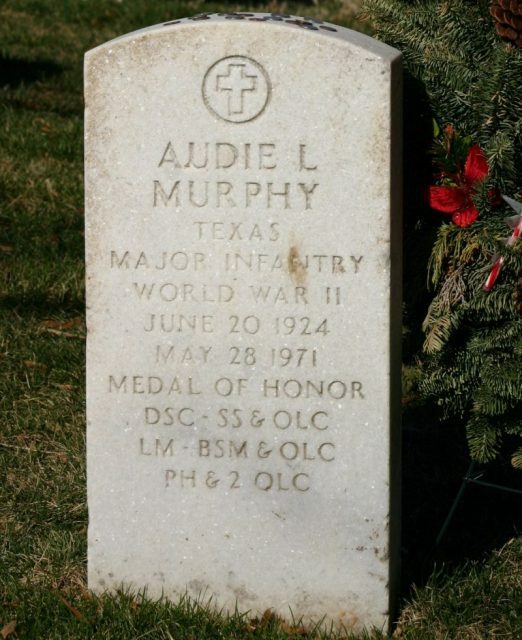 Murphy was a Texan of Irish descent but was not what you might call a typical example. He always looked younger than his age and was softly spoken. How many World War Two heroes can you name that went onto have successful careers in the movies? Maybe just a handful? Well, to start with, there was George Kennedy. Although you may not know his name, you might have recognized his face from over 200 appearances in television and films. You may have seen him co-starring in classic movies like Cool Hand Luke in 1967 alongside Paul Newman, for which Kennedy won an Oscar for Best Supporting Actor. He was also in the highly successful Naked Gun series of comedies (1988 to 1994) with Leslie Nielsen. What few people know about him is that he was also a decorated Infantry Captain in the US Army during World War Two and received two Bronze Stars for heroism in the combat zone. 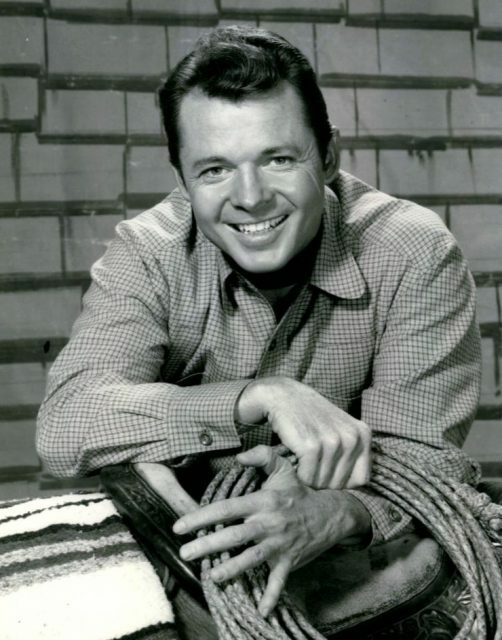 Photo of Audie Murphy as Tom Smith from the television program Whispering Smith. Another World War Two veteran and Oscar winner was Lee Marvin. He won an Oscar for Best Actor for the comedy-western Cat Ballou (1967), although he is probably best known for his WW2 war movie The Dirty Dozen (also 1967). He also had a hit record Wandering Star in 1970 from the Western musical Paint Your Wagons. It was number one in the United Kingdom and Ireland for three weeks. But back in 1944, Marvin was a 20-year-old Private 1st Class in the Marines, and during the Battle of Saipan in the Pacific Theatre, he and his company came under heavy Japanese machine gun fire. 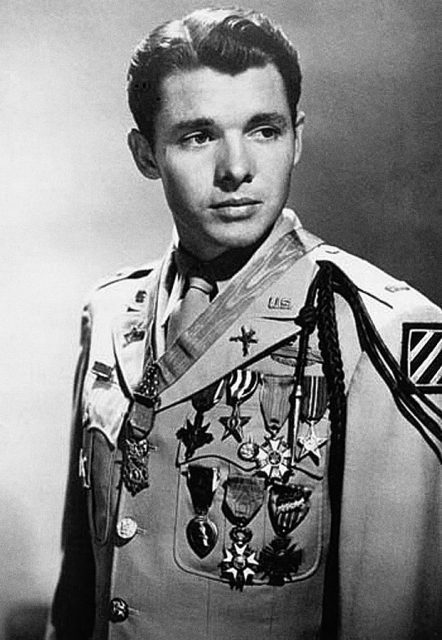 Audie Murphy photographed in 1948 wearing the U.S. Army khaki “Class A” (tropical service) uniform with full-size medals. A war hero and “an object of passion” of countless women. His company took heavy casualties, and Marvin himself was badly wounded. Then he had the bad luck to be shot in the foot moments later by a Japanese sniper. He was awarded a Purple Heart and Combat Action Ribbon for his actions, and his unit received the Presidential Unit Citation for extraordinary bravery in combat. 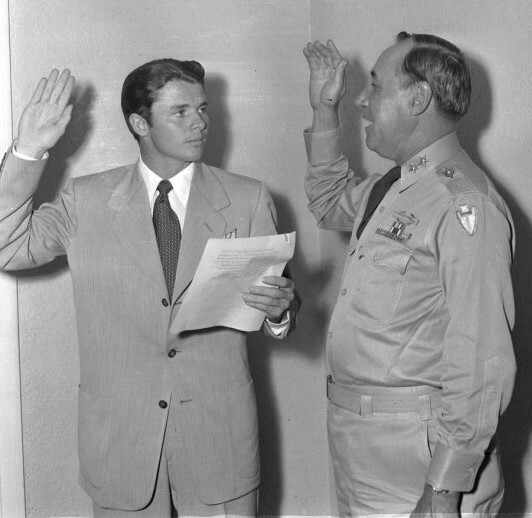 But one name undoubtedly stands hands and shoulders above all the rest: Audie Murphy. 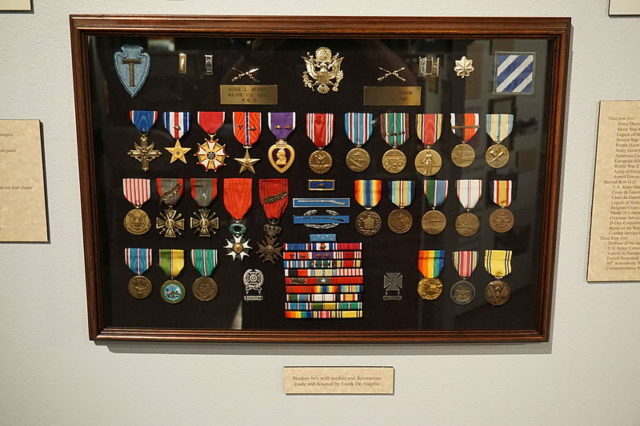 Though he never won an Oscar, as far as military awards and medal go, he became the second most decorated serviceman in the history of the US Armed Forces. And what made it all the more amazing was that he achieved all this in less than two years (1943 to 1945) and before he was 20 years old. Medal of Honour: the highest US Military award for extreme gallantry and risk of one’s life while in combat. Distinguished Service Cross: the 2nd highest US Military award for extreme gallantry and risk of life in combat. Silver Star (Twice): the 3rd highest US Military award for gallantry in action against an enemy. Legion of Merit: exceptional conduct in the performance of outstanding duty. Bronze Star (Twice, once with ‘V’): for heroic service in a combat zone. The ‘V’ is added for valor in combat. Purple Heart (Three times): for being wounded in action. French Legion of Honour: the highest French military award for bravery on the battlefield. French Croix de Guerre: the French War Cross is given for military feats of valor. Belgium Croix de Guerre: the Belgium War Cross is given for bravery on the battlefield. This list does not include several campaign medals, bars, badges, and civilian awards he also received. Murphy was a Texan of Irish descent but was not what you might call a typical example. He always looked younger than his age and was softly spoken. Most people who had met him said he seemed decent and likable. He was accepted into the Army ten days after his 17th Birthday on June 30, 1942, although to get in he had to falsify his age since in the United States at that time the minimum enlistment age was eighteen. During Army basic training, he qualified as a rifle marksman and became an expert with a bayonet. 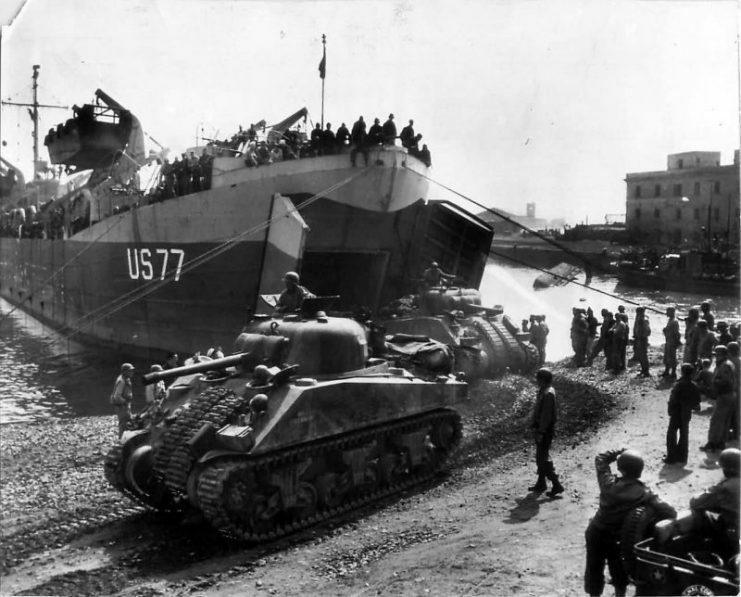 At the beginning of 1943, he was shipped out to Europe where he first took part in the invasion of Italy and then, later in 1944, he saw action in France. Although he was wounded several times and also had two bouts of malaria that hospitalized him, he continued to return to service again and again. 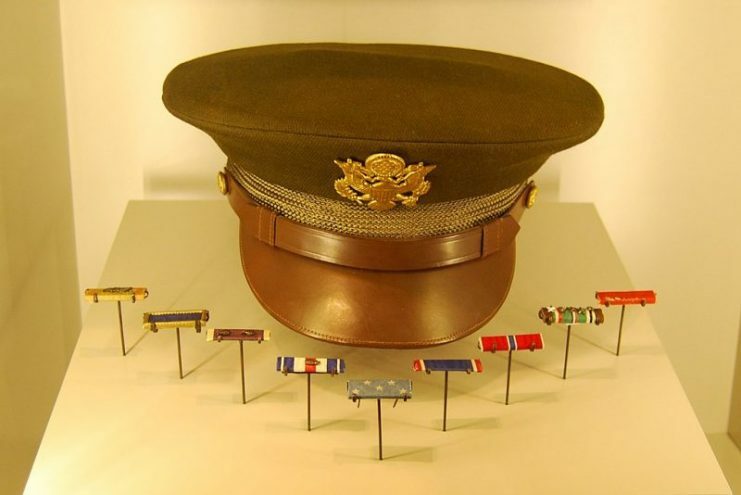 By this point, he had received numerous medals and awards and had reached the rank of Platoon Sergeant. Then, in January 1945, came his most famous heroic moment for which he was to receive the Medal of Honor. Murphy single-handedly held up an advancing German force by firing at them with his carbine while calling in artillery support by radio. With complete disregard for his own safety, he instructed the artillery to fire directly on his position. 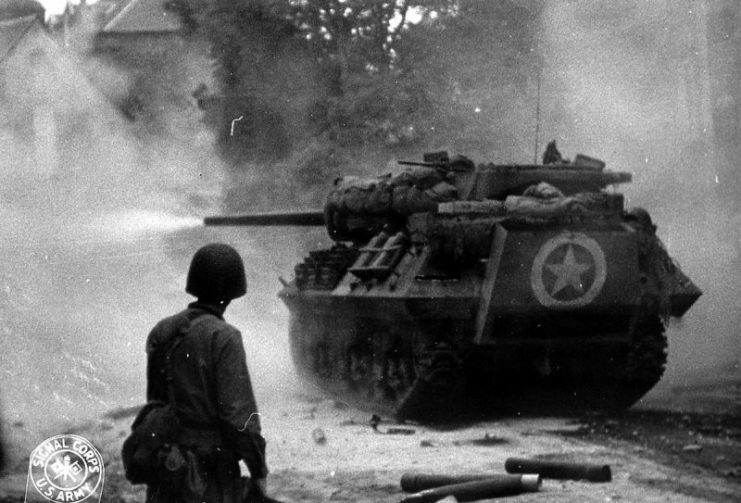 At one stage, he stood on top of a crippled US M10 tank destroyer which was ablaze while firing its .50 heavy machine gun at the advancing Germans. This heroism went on for over an hour even though he was badly wounded in the leg. He is reckoned to have killed or wounded around 50 German soldiers. He then led his squad in a successful counterattack that pushed back the Germans. He ended the war as a 1st Lieutenant. After attending many parades, banquets, and speeches across the United States in his honor, he left the Army having received every U.S. military combat award for valor that there was at the time. For the next few years, he was involved in training new recruits in the Texas National Guard, in which he was now a captain. It was during this time that the actor and producer James Cagney (famous for his roles in gangster movies) showed an interest in developing Murphy as an actor. But it all came to nothing after a falling out between the two in 1947. However, encouraged by the Hollywood writer David McClure, Murphy secured a small part in the love drama, Beyond Glory. This was quickly followed by another small part in the romantic comedy, Texas, Brooklyn and Heaven. Although he was only in one scene, it did generate some newspaper headlines as it marked the movie début of the most decorated war hero of World War Two. Confusingly, despite Texas, Brooklyn and Heaven being filmed first, it was not released until after Beyond Glory. All this interest in Murphy led to his first lead role in the movie Bad Boy (1949). In this movie, he plays a juvenile delinquent. Despite being 24 years old at the time, Murphy was convincing in his performance of a troubled teenager. After this promising start, he was signed up by Universal Studios on a seven-year contract. 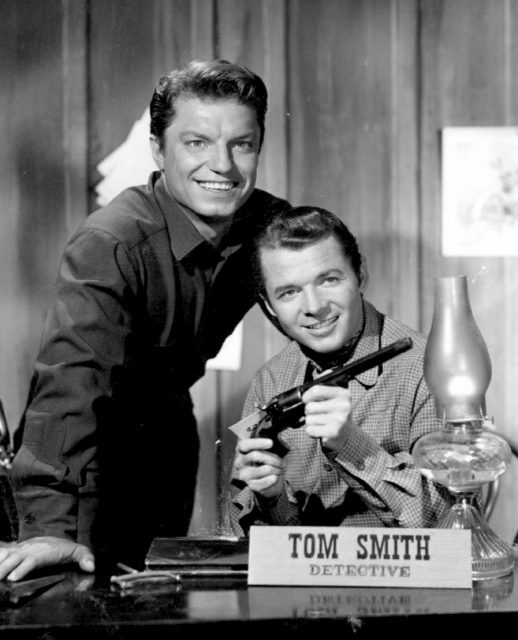 Photo of Guy Mitchell (left) and Audie Murphy from the television program Whispering Smith. His first movie with them was the Western The Kid from Texas (1950), where he starred as the outlaw Billy the Kid. The movie was a fictitious account of the life William Henry McCarty Jr (Billy the Kid), and it tried to paint him as a misunderstood noble folk hero. Sierra (1950) A Western where Murphy plays a young man wrongly accused of murder who then has to risk everything to get help for his injured father. Tumbleweed (1953) Another Western and another case of being accused of something he did not do. This time, he is a diligent and highly moral guard on a wagon train. He is accused of cowardice when his wagon train is robbed and most of the passengers massacred. He spends the majority of his time trying to prove he is innocent with the help of his intelligent horse, Tumbleweed. Hell Bent for Leather (1960) Mistaken for a murderous outlaw, an innocent passer-by is forced to go on the run to try and clear his name by catching the real villain. Despite making over 40 Hollywood movies in a career that spanned 21 years, he failed to find that one iconic role for which he will be remembered. Ironically, the closest he came was with the movie To Hell and Back. 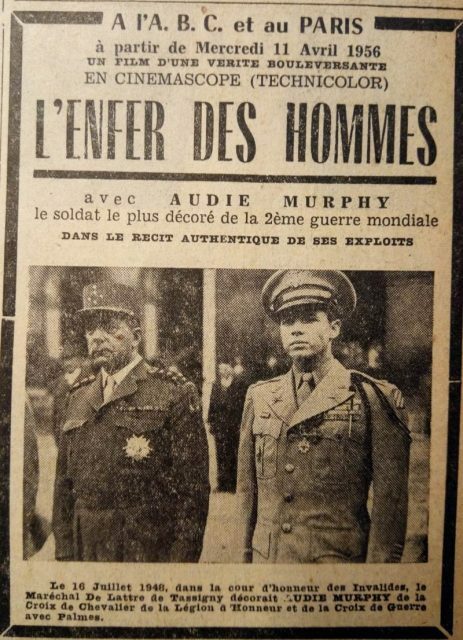 With a war hero turned movie star, it was inevitable that a film would be made of Murphy’s heroic exploits in World War Two. 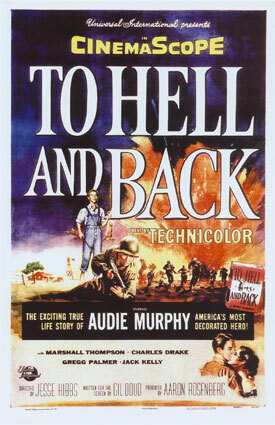 In 1955, Universal Studios decided to make a film of Murphy’s autobiography To Hell and Back. Murphy was reluctantly persuaded to play himself. The film was a huge box office success and garnered good, but not great, reviews. 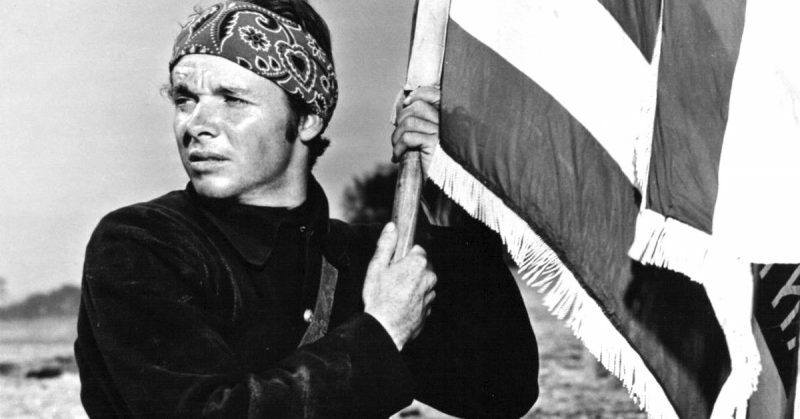 He did come close one other time, and that was four years earlier in 1951 when he made the American Civil War drama called The Red Badge of Courage. It was directed by the legendary Director John Huston (African Queen, Prizzi’s Honor, Annie) who, on reflection, thought that it was potentially the best movie he had ever made. 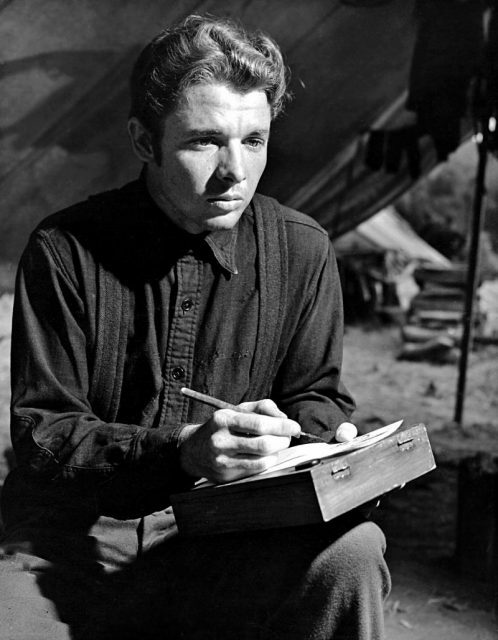 Original studio publicity photo of Audie Murphy for film The Red Badge of Courage. Sadly the studio cut out around 50 minutes of the original version before it was released and added some unwanted narration. The film was a commercial flop and critical disaster. It is often referred to as a mutilated classic. Afterward, Murphy felt frustrated, as he saw it as a lost opportunity to make something really special. Throughout his career, Murphy mainly starred in mediocre Westerns like Kansas Raiders, The Duel at Silver Creek, Drums Across the River, Destry, and Posse from Hell. By the mid-60s, Westerns were going out of fashion and Murphy’s career was struggling. He started having money problems and was obliged to star in the 1966 spy thriller Trunk to Cairo at a much-reduced fee. This was his first non-western movie in eight years. It was a cheap James Bond parody, and Murphy hated making it. He even tried, unsuccessfully, to pull out of it. His career continued to decline, and he made just two movies in the next two years, both of which were Westerns. The last of these he was forced to finance himself, and it was called A Time for Dying. He was the co-star, not the lead, and it was beset by money issues. The film had to be shortened, and for the next two years, it was stuck in post-production due to a lack of funds. Though it was finally released in France, it did not get shown in the United States until 1982 for legal reasons and then for only a very limited run. A Time For Dying was to be his last movie, as his career went into a downward spiral as project after project stalled or got canceled. Then on May 20, 1971, fate intervened and he was killed along with five other pilots in a plane crash in the Brush Mountain, near Catawba, Virginia, in fog and zero visibility.